Blackberry has finally decided to stop manufacturing smartphones, and it is expected that the Blackberry Mercury is going to be the last Blackberry-made phone. It will be unveiled at the Consumer Electronics Show ( CES) next year, and TCL is going to show off the phone at the event. The last Blackberry-made device will retain the legacy of the company as it is surely going to have a QWERTY keyboard. Today, the Blackberry Mercury Render leaked that show that the device will be similar to the Passport regarding design but just a smaller and also not so wide version of it. BLACKBERRY MERCURY RENDER: IS THIS HOW THE PHONE WILL LOOK? Well, you can see the render above and admittedly, it is pretty much similar to the Priv. If we compare the QWERTY keypad with the Passport, Mercury’s keyboard includes punctuations and numbers whereas that of the Passport has only Letters. One interesting feature that we are going to see in the Blackberry Mercury is the placement of fingerprint scanner. 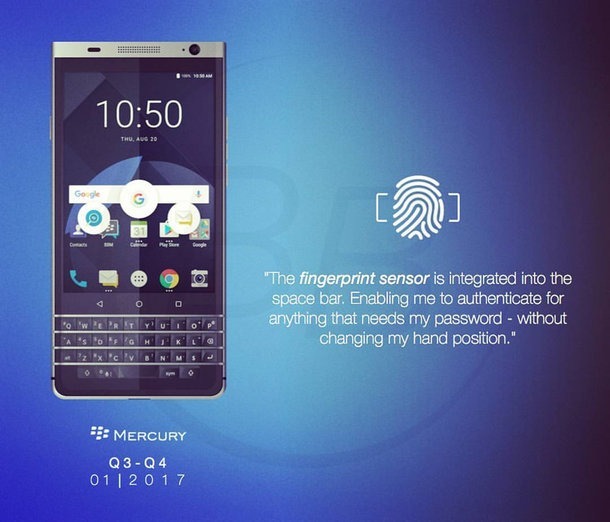 The Blackberry Mercury Render reveals that the fingerprint scanner will be inbuilt inside the Space-bar of the keypad. mmm.. Blackberry is trying something unique! There are so far not many leaks regarding the specifications, but rumors reveal that the Blackberry Mercury will come with Snapdragon 821, Adreno 530 GPU and a pretty big battery able to keep the phone ON for the whole day. With the QWERTY keyboard, it is obvious that the screen size is going to be small. The device is expected to feature a 4.5-inch display.